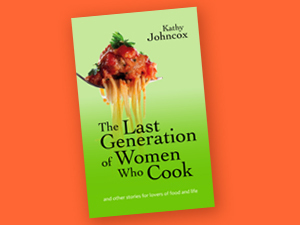 Stories in the collection, The Last Generation of Women Who Cook, are believable and engaging, laced with a pinch of humor and sprinkled with a dash of irony. Meet a cookbook author and an Irish poet who silently blame each other for cookbooks and poems destroyed in a fire. See how a beef barbecue dinner at a dude ranch offers a computer programmer new hope. Read about a pasta dinner that shows a divorcee the true colors of her new husband. The collection is now available at www.Amazon.com.